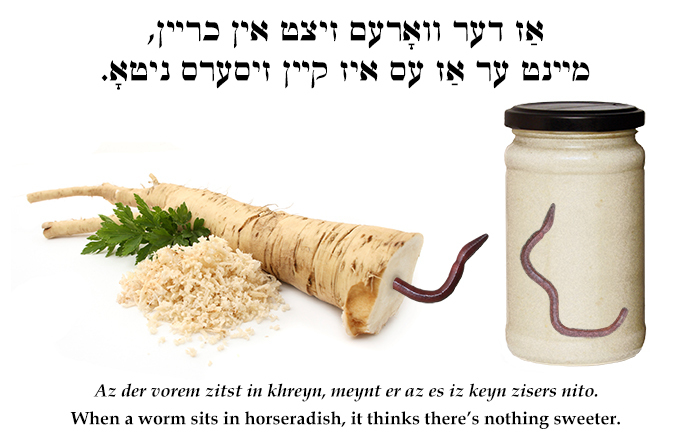 Yiddish Wit: When a worm sits in horseradish, it thinks there's nothing sweeter. אַז דער וואָרעם זיצט אין כריין, מיינט ער אַז עס איז קיין זיסערס ניטאָ. Az der vorem zitst in khreyn, meynt er az es iz keyn zisers nito. When a worm sits in horseradish, it thinks there's nothing sweeter.